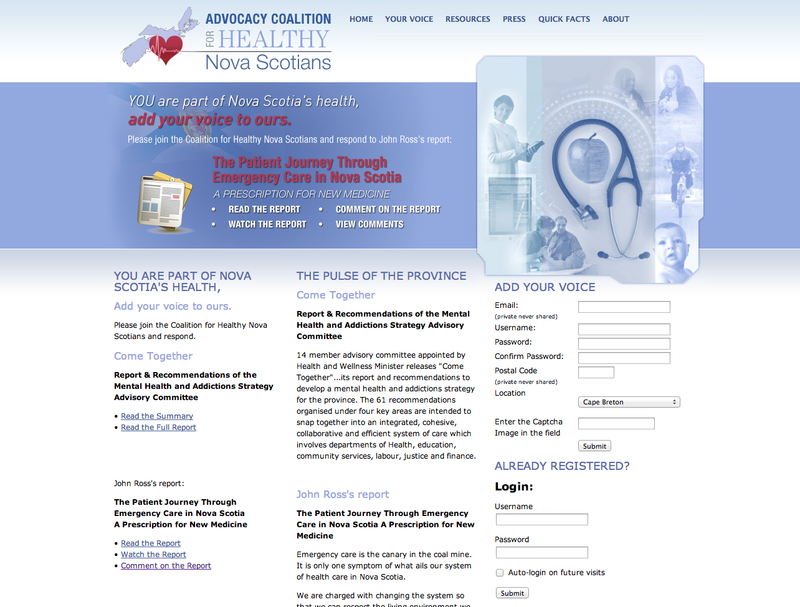 This site is a hub for getting the message out regarding Dr. John Ross's Report "The Patient Journey Through Emergency Care in Nova Scotia - A Prescription for New Medicine" as well as the Report & Recommendations of the Mental Health and Addictions Strategy Advisory Committee. The website aencourages the public to get informed about these reports and provide feedback. We are a group of Nova Scotians who have come together to create this coalition so that the key messages in this report are carried forward and transformed into meaningful action. We believe that each community should understand the needs of its members and bring forth their ideas to improve the system that cares for them when they are ill. The social determinants of health must be embedded in a healthy living environment to sustain the wellness of each individual and the community. We must each take responsibility to consider the impact of any proposed solution on the environment, people, community and build in long term economic sustainability. Innovation and resourcefulness, the exploration of new solutions, looking at current inefficiencies and waste in the system at large alongwith strategic investment in infrastructure hold the promise of creating new pathways to care.